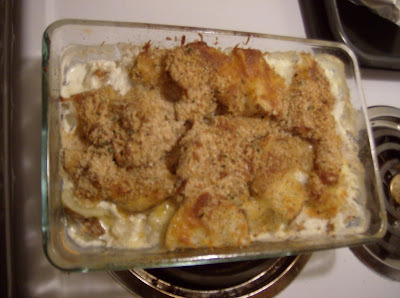 Single Girl Gourmet: Simple scalloped potatoes - from Japan? So this recipe is very approximate, given my aforementioned ignorance of Japanese. Slice the potatoes, making sure to slice them all into a similar size. Place in a pot and cover with water. Cook on high heat for 10-15 until almost cooked (cooking them partially on the stove cuts down the oven cooking time significantly). Place the semi-cooked potatoes in a baking pan and cover about half-way with cream. You can use half & half to make it a little healthier (and cheaper) but you will need to bake it a little longer so that it thickens. Sprinkle with salt and pepper. Sprinkle about 1 cup of cheese over the top (you can use just about anything, in Holland we used Gouda, today I used Colby Jack) and put a tablespoon of butter in 2 or 3 different places, top with bread crumbs and bake. So, on our oven in Holland you could not adjust the temp (challenge), in short you want to bake it until the cream reduces and thickens. Today (my first time making this in the US) I baked it at 350 for 20 min and another 20 min at 250. I'd say bake it longer at a lower temp in general. I was a little heavy handed with the bread crumbs this time, but still tasty! This is also excellent the next day, better I think actually.